OVER 1,000 pages of documentation showing how publicity was handled by the Department of Health during the swine flu season have been released to The Detail under Freedom of Information legislation. The papers show the truth of the vaccine shortage, the pressure the department came under to announce information on swine flu deaths and how an attempt not to create public panic backfired. Extracts below show how the situation developed. October 1st, 2010: Email from Alison Marley in the Private Office to Dr Liz Mitchell (Deputy Chief Medical Officer), Dr Michael McBride (Chief Medical Officer) and staff in the press office. Notes information from Australia which indicates an increased incidence of febrile convulsions in children who receive the vaccine marketed in the UK as Enzira vaccine. 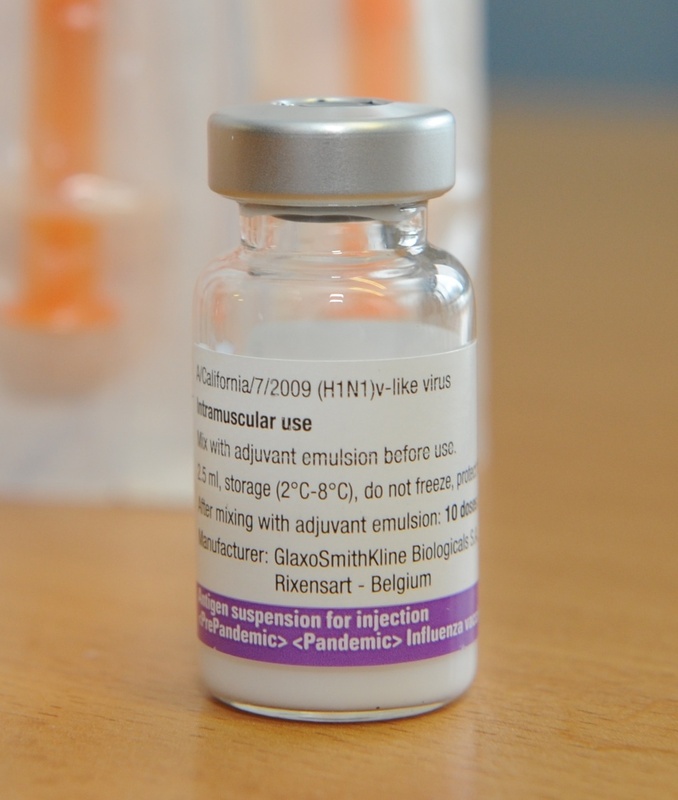 “This information only emerged after the central procurement process had been completed and in consequence 100,000 doses of Enzira vaccine have already been purchased for use in Northern Ireland.” GPs advised not to offer Enzira to children aged under five and are instead told to give them another product not associated with this complication. October 26th: 10.50pm. Email from Dr Liz Mitchell to Michael McGimpsey and others to inform him of second lab confirmed cases of H1N1 flu this season. October 27th: Public Health Agency confirms that a case of influenza has been reported in a pupil attending Ceara Special School in Lurgan. On the same day a “restricted” memo is sent from the Emergency Planning Branch to Dr Liz Reaney (Senior Medical Officer in Department of Health) and Michael McGimpsey. The document states that the child – who has underlying medical (neurological) conditions – has been admitted to intensive care. She had lab-confirmed swine flu. It stresses in bold “*this information is not yet in the public domain*” but warns that media interest is likely. November 5th: Letter from Dr Kathryn Bell, clerk of the Health Committee, to the departmental assembly liaison officer requesting an update on swine flu following the child death. Public Health Agency issues a press release calling on all pregnant women to get their flu vaccine. 5pm – Urgent submission sent from Dr Reaney to Michael McGimpsey about an increase in the number of confirmed swine flu cases in laboratory reports over past few days. In last 10 days, 10 confirmed cases reported. At least eight of the cases are known to be in hospital, including three maternity patients. One is in ICU. She also writes an email on the appropriate response to take when asked by media and others about the number of deaths. She stresses that there will be no cumulative total of deaths as this would be “incomplete and misleading”. January 5th: Michael McGimpsey writes to Jim Wells (chair of Health Committee) to update him on work being done to manage seasonal flu in Northern Ireland. Transcript of interview on Nolan Show with John Compton (chief executive of the Health and Social Care Board), following interview with health professional the previous day who alleged the serious swine flu outbreak was being played down. Mr Compton confirms that elective surgery has been suspended and that 42% of intensive care beds are occupied by people with flu. He also states that “fitter people” have been affected in a greater number this year. Dr Kieran Deeny is also interviewed and says that his own practice and others are running low on vaccines. In response, Mr Compton says: “There is no problem with vaccines in Northern Ireland.” Dr Deeny also says that urgent guidance is needed for GPs on what to do when healthy people request to be vaccinated. January 7th: Dr Carolyn Harper is interviewed on BBC’s Stephen Nolan Show. Transcript shows how he pushes Dr Harper to state exactly how many of the 33 people currently in intensive care with flu have underlying health conditions. She said it would be around 40-50%. Stephen asks: “Why don’t we all have a right to access to this flu jab if half of those people with their life under threat have no underlying health condition?” And he continues: “It is surely responsible for you to either confirm or set the record straight as to how many people in Northern Ireland this year have died from swine flu.” Dr Harper said: “I am not going to give you a number because if I give you a number that is going to be misleading to the public.” Stephen said it was “incredibly patronising and condescending to suggest that the public are so stupid that they cannot deal with the information that you can deal with.” Jim Wells also interviewed and says “it is like pulling teeth to get the information out of those representatives of the PHA.” He said that people want clarity and statistics not a drip feeding of information. “If the PHA withhold the information or seem desperately reluctant to let it out into the public domain then that only feeds suspicion and causes panic.” He said it was a major change this year to have a substantial number of people in intensive care who had no underlying medical conditions. January 9th: Press release issued by the Public Health Agency stating it is aware of 14 deaths since November 1 of people who had the swine flu virus. Ten had underlying health problems. It was “not yet known” whether the other four had underlying health problems. January 10th: Email from Dr Richard Smithson (Consultant in Communicable Disease Control at the Public Health Agency). He writes: “The last two days have seen a significant increase in vaccine orders in spite of the cap which we have placed on them with a total of 6,670 doses being ordered in the last two working days. The total vaccine in stock is 3,350. It is therefore apparent that unless we get 10,000 doses which we have tried to acquire from Scotland, we will run out of vaccine by Wednesday. We are currently comparing the amount of vaccine delivered to each practice with the amount that they have reported as using and contacting those practices with the biggest discrepancy to see if they have any spare.” A question and answer sheet was prepared for patients to explain why they would be given the swine flu vaccine rather than the seasonal flu jab. Transcript of Dr Carolyn Harper being interviewed by Mark Carruthers on Good Morning Ulster. In this interview he asks her did she get it wrong holding information back from the public? Dr Harper replied: “I think it is a fair comment that perception, that we were perhaps hiding something by not publishing the figures did lead to a level of public concern. It wasn’t unique to Northern Ireland. There was a similar debate going on last week in England and they also moved to publishing weekly swine flu deaths.” She also said that swine flu deaths were being under-reported in other parts of the UK. January 12th: Line in media briefing paper states that it is estimated that there may be around 50-80,000 doses of seasonal flu vaccine currently with GPs and Trusts that has not been used yet. Briefing paper for Minister says that weekly flu bulletin the following day will state there have been a total of 17 swine flu related deaths since November 1 – 14 had co-morbidities, two did not and information on the final case is awaited. January 13th: Paper on lines to take for a media briefing. It stresses that “there is no shortage of safe, effective vaccine to provide protection against swine flu.” And it states that revised arrangements to reinstate weekly deaths reporting have now been put in place given the currently high levels of seasonal flu that are circulating. And press release issued by PHA aiming to reassure the public after two deaths of people with no underlying health problems. January 14th: Letter from Dr Michael McBride to Professor Andy Hall (Joint Committee on Vaccination and Immunisation) written at the request of Michael McGimpsey to ask if the committee recommends any change in the policy of vaccinating children aged under five given increased public concern about recent deaths of children in this age group across the UK. It also states that a total of 17 swine-flu related deaths have been announced, and: “Sadly we are aware of a further death this afternoon and expect a second one before the weekend is over.” Media briefing paper on January 18th states that JCVI advised that advice remains the same – vaccine should be offered to those in at risk groups and those over 65. Seanin Graham (health correspondent at the Irish News) emails to ask for a comment after receiving a call from “a very concerned GP” who said his health centre can no longer get the seasonal flu vaccine. He has been told they will instead be getting the H1N1 vaccine. Seanin said that the doctor is concerned given the reassurances given by John Compton last week in relation to Northern Ireland having enough supplies. January 15th: Press release from Michael McGimpsey offering his condolences to the family of a two-year-old boy from the Republic of Ireland who died from swine flu in intensive care in Northern Ireland. And, in the evening, the department also releases a statement about the death of a 10-month-old baby who had an underlying medical condition. He died from swine flu in intensive care. January 16th: Mr McGimpsey’s private secretary emails Dr Elizabeth Mitchell to ask for additional material for the Minister prior to a briefing. As well as information on patients currently in intensive care, she said the Minister also wants to know how many vaccines have been received and the number of patients vaccinated at Dr Deeney’s practice. Vaccination figures from Martin Coleman at Department of Health among at risk groups. Email shows that 57% of pregnant woman were vaccinated, 48% of frontline health staff, 38% of healthy children (aged between six months and five years), 75% of 65 years and over ‘at risk’ and 87% of under 65s ‘at risk’. January 19th: In an email to press office staff, Dr Reaney said that the number of swine flu deaths cannot be directly compared across the four UK countries as there are differences in the definition of what is being counted, the timeliness of obtaining that information and the completeness of the information. An agreement is reached to put out the figures with the caveat that the data is not directly comparable. A paper on a media briefing to take place the following day stresses there is “no shortage of safe, effective vaccine to provide protection against swine flu”. January 20th: PHA press release confirms 21 people from Northern Ireland have died from H1N1 flu during the current flu season. Of these, 18 had underlying medical conditions, two did not and one unconfirmed. In notes to the editor, death of child resident in Republic is mentioned as an additional case. January 21st: Department response to press query from the Ulster Herald states that there are around 400,000 swine flu vaccines left in stock. February 3rd: Email from Richard Smithson confirms that £145,000 was distributed to GPs to call in ‘at risk’ patients for vaccination – to be spent on envelopes and postage or phone calls. February 9th: Weekly flu bulletin confirms four more deaths reported the week before. Total number of swine flu related deaths reported is 29. Of these, 26 had an underlying health problem, two did not and one is not yet known. February 16th: Weekly flu bulletin. No flu deaths reported this week.